One of the most important tools in the DAS laboratories is the new SEM with EDS. The HIROX SH- 4000M provides high resolution with high magnification. 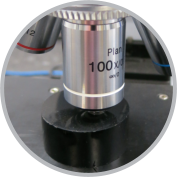 The SEM is used primarily for detailed metallurgical examination and for elemental detection. With two types of detectors available, the Secondary Electron Detector provides detailed topographical analysis of components in contrast to the Backscattered Detector which provides clear analysis of components with compositional variations; the Laboratory is able to provide detailed work from fracture morphology to staining and particle analysis.